The best part about training for a spring race is that you train through all conditions, which means you're ready for whatever race day has to offer. Having the right equipment also ensures that you are ready for anything! Now that the snow—and with it our primary excuse to bury ourselves in blankets instead of running—has melted, we're turning out attention to those must-have products that will get us to race day healthy, happy, and confident! Body Glide & Nip Guards - In hot, humid weather, chafing is inevitable. Repetitive motion causes rubbing that even the best technical fabrics cannot always stop. Long runs are hard enough already, without adding this extra discomfort. 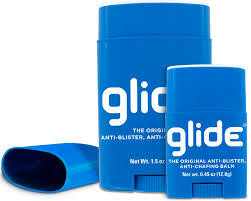 We use tried and true Body Glide. It's colorless, odorless, and rolls on just like deodorant. Injury Prevention Tools - Let’s be honest, most days it’s all we can do to get a workout in. We take off running with a moments’ notice, usually in the cold, and we resume normal activity as soon as possible when the workout is over. Most of the time, our muscles are cold and tight leading to soreness and overuse injuries. Massage tools make it easy to take preventative measures so that you can train comfortably while avoiding the aches and pains that get in the way of your daily routine. Ask us for an in-store demonstration! Visibility – It is important to see and be seen! By wearing multiple points of light the human form is recognizable in low light conditions much sooner than if you wear little to no reflectivity. In addition, wearing or carrying something that lights the path ahead ensures safe footing and alerts drivers of your presence. Drivers are more distracted than ever these days. Make sure you’re staying safe out there. Through the start of daylight savings, all reflective gear is 25% off. Hydration and Nutrition - Dehydration is one of the major causes of running injuries. Even in the absence of serious injury, it also just makes running plain uncomfortable. On those long, lonely runs, it's important ot have a way to carry water—or even better, an electrolyte drink like Nuun. If you’re training for more than 45 minutes to an hour, you'll also need some fuel and a way to carry it. There are a lot of options when it comes to hydration and nutrition solutions. Over the last year, we've added several new brands that we're very excited about, including Generation UCAN! The important thing to know is that these solutions do not have to be uncomfortable or cumbersome. Your hydration and nutrition plan should be part of your training so that you aren’t surprising the body on race day. If you haven’t found something that works, don’t delay! Let us help. Headwear and Eyewear – Protecting the eyes from harmful rays is just as important this time of year as it is in the summer. We love Tifosi for their shatterproof lenses, hydrophilic rubber pieces that don’t slip when wet, and the large selection of styles. Top your look off with a technical run hat that offers sun protection while keeping precipitation out of your eyes. Both of these items are helpful year-round.